Service Rank and Number / Rheng gwasanaeth a rhif: Sergeant No. 203161. Killed in action on Wednesday 26 September 1917, during the Battle of Passchendaele (also known as the Third Battle of Ypres), aged 27 years. John Ivor Amos was born in Rhyl, Flintshire, North Wales during 1890. The 1901 Census shows that the family lived at 5 High Street, Rhyl, Flintshire. The head of the family was Edward Amos aged 56, who was employed as a General Labourer. His wife Catherine Amos aged 43 and their four children – Thomas Amos aged 18, a Sawyers Labourer, Edward Amos aged 13, a Messenger Boy, John Ivor Amos aged 10 and Arthur Balfour Amos aged 3 years. Little is known of his early life, but on leaving school he obtained employment with the London and North West Railway Company as an Engine Cleaner at Rhyl Railway Station. On 10 April 1908 aged 18 years 2 months he enlisted with the Royal Welsh Fusiliers Territorial Force at the Drill Hall, Rhyl. His Attestation Certificate – British Army Territorial Force Record can be viewed at (www.ancestry.co.uk). On enlistment he is described as 5′ 8″ tall, Chest Measurement 33″, Expansion 2″. His physical development was described as good and according to the Recruitment and Medical Officer he was fit for Military Service. During April 1911 John was still living at home but was now employed as a House Painter. He carried out his commitments as a soldier with the Territorial Force, attending all the training sessions that were required and on 30 April 1913 he was promoted to the rank of Corporal. At some stage he married Kate Johnson of 9 Small Brook, Whitchurch, Shropshire, England and they lived at 26 Bedford Street, Rhyl, Flintshire. They had one son, John Arthur Amos who was born on 18 March 1916. John Ivor Amos had one slight blemish on his Military Record. On Saturday 4 July 1914 at Chester he appeared before his Commanding Officer charged with ‘ Not getting out of bed when ordered’. He was severely reprimanded for this offence, but it didn’t appear to have done him any harm for 11 days later he was promoted to the rank of Sergeant. On Wednesday 5 August 1914 he was embodied into 2nd Battalion Royal Welsh Fusiliers, retaining his Territorial Army rank of Sergeant. On Wednesday 14 July 1915 with the Mediterranean Expeditionary Force he embarked H.M.T. Ship Caledonia at Devonport for Gallipoli, via Alexandria, arriving at Sulva Bay on Sunday 8 August 1915. He was wounded two days later on Tuesday 10 August 1915 and following treatment on one of the hospital ships was repatriated to the United Kingdom. 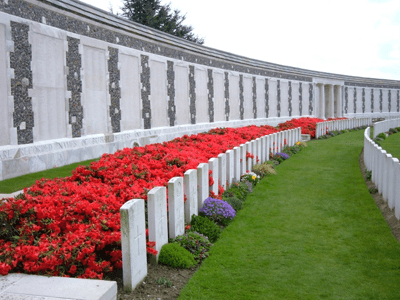 A number of Flintshire soldiers were killed in action on 10 August 1915. On Wednesday 13 June 1917, John embarked a ship at Southampton for Rouen, France arriving there on Saturday 16 June 1917. On 29 May 1918 a payment of 3s.8d was made by the War Office to Mrs Kate Amos, being monies owed to her husband John. On 21 November 1919, a further payment which is recorded as a War Gratuity of £17.0s.0d was also made to her. He is also remembered on a Remembrance Plaque at The Royal Alexandra Hospital, Marine Drive, Rhyl, Flintshire and on the North Wales Heroes Memorial Arch, Deiniol Road, Bangor, North Wales.. There is no Flintshire Roll of Honour Card for John Ivor Amos at the County Archives Office, Hawarden, Flintshire.